The bouldering in the Virgin Islands has been on my radar for a few years now with a couple of climbing movies having been filmed there and knowing a couple of people who have made the trip. I never really considered going there myself, at least not until I was given a copy of the new guidebook to the area written by Rich Crowder and Jonathon Wasser. As I dove into reading the book I quickly realized that a bouldering trip to the Virgin Islands is really about much more than the climbing. The first 1/3rd of the book is dedicated to details other than climbing like detailed instructions on how to get there, potential itineraries, suggested activities that aren’t climbing and the always helpful pirate vocabulary lesson. Once you get into the climbing section of the guide it has everything you would expect from a modern climbing guidebook. 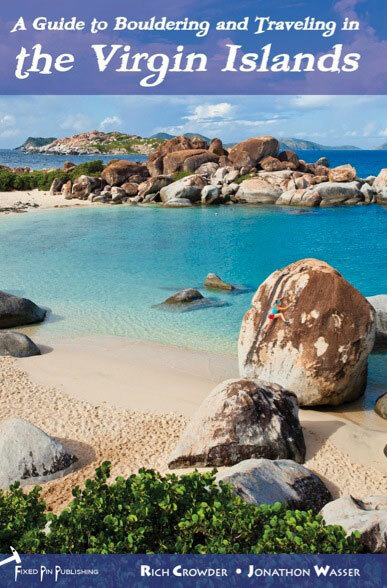 It’s loaded with great photos and color maps of areas with all the beta you’ll need to explore the bouldering on the Virgin Islands. As I finished reading the book I realized that there was really no choice: at some point I need to make trip to the Virgin Islands. Not so much for the climbing itself, but for the entire experience. I’d highly recommend Virgin Gorda for a very chill, climbing-related trip. It’ll work with a non-climbing significant other too, since the boulders are on the beach and it’s too hot to climb all day anyway. If you’ve got the dough, charter a sailboat for a week and do the BVI. Went a few years back. This place is certainly not a climbing destination. It’s way to hot to climb by 7 a.m. although you will try. Its gods biggest joke on climbers. If the area ever falls into a mini ice age It would be an amazing place to climb. But til then go there to drink and relax. Take your climbing shoes elsewhere. The lodging on Virgin Gorda runs the full gamut, from sleazy rooms down by the marina, vacation homes by the beach, to five-star resorts. There are several hotels such as Fischer Cove and Leverick Bay Resort that cost about $100 per night. You can rent a vacation home on the beach from places like Guavaberry Spring Bay Vacation Homes for about $100 per night. At the high end, the world-renowned Bitter End Yacht Club is hailed as one the finest full-service resorts in the world for about $800 per night. Little Dix Bay near Spanish Town has suites for as little as $1,500 per night. Be warned, Virgin Gorda is a Third World island with restaurant prices that will make a New Yorker’s head spin. This island is definitely not for penniless Camp 4 climbing bums. If you plan to eat out, plan to spend $125-$150 per person, per day. The cheapest route would be to travel with a group, rent a vacation home and shop at the commissary instead of eating out.